Should You Condition After Co-Washing? "I'm new to co-washing and I've been using products that are specifically called 'co-wash conditioner.' I'm really loving the results on my hair so far but my question is, should I still be using a regular conditioner after the co-wash conditioner?" This is really going to be specific to your unique curls and the kind of moisture they need. Pay close attention to your hair while you're testing out this new cleansing routine of yours to see if the cleansing conditioners you're using are providing enough moisture for your curls, as this will also vary based on the conditioner you are using. 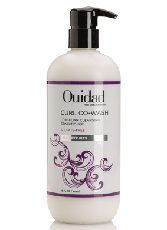 Our own Curl Co-Wash is unlike most cleansing conditioners in that it contains a concentrated blend of conditioners and oils plus a gentle, naturally-derived coconut cleanser that will not dry or strip your hair. If you feel that you still need more moisture you can always follow with a leave in conditioner. Optional: If you feel that you need more moisture you can follow with a leave-in conditioner like our Moisture Lock or a primer prior to styling prior to styling.